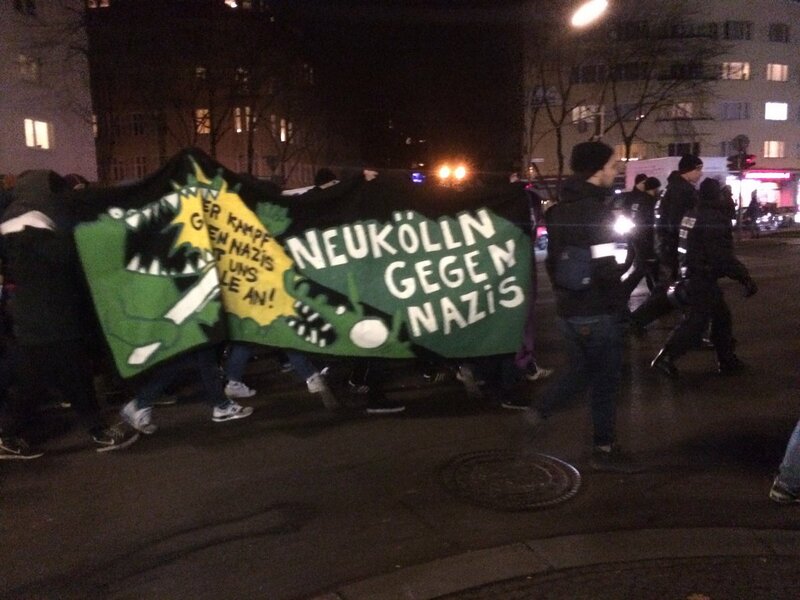 Last night about 1300 people marched through Berlin’s Neukölln district. It was a strong antifa demo after several attacks by fascists in Neukölln. On the night between the 11th and 12th of December there were at least three assaults by fascists in Berlin’s Neukolln district: an arson attack against the left-wing café collective k-fetisch; an attack with stones against the Leporello bookstore, which hosted a meeting against the Afd 10 days ago; an attack with stones and spray-paint against the apartment of a left-wing activist. These attacks are not the first and they will not be the last: the facebook page of the Nazi group „Freie Kräfte Neukölln“ (Free Forces Neukolln) recently published two graphs, one with left-wing locations and another with shelters for refugees, to be treated as potential targets.